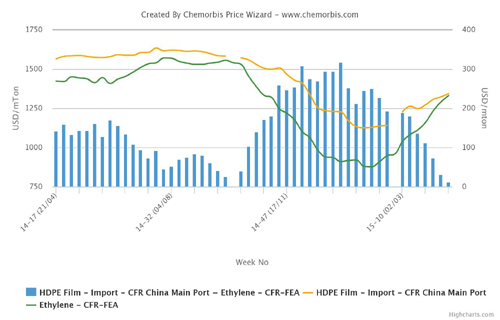 Players active in China commented that the imbalance between spot prices for ethylene and PE continues to intensify, with data from ChemOrbis Price Wizard showing that import HDPE film prices are now trading at a discount to ethylene. LLDPE film prices, meanwhile, continue to trade at a discount to ethylene, as has been the case for most of the past month. LDPE is the only one of the major PE product groups still carrying a premium over ethylene, although the premium carried by LDPE is not high enough to cover the theoretical breakeven costs of a non-integrated regional producer. 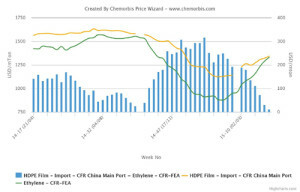 As reported on www.ChemOrbis.com, spot ethylene prices on a CFR Northeast Asia basis have continued to follow a steady to firmer trend over the past few weeks even as weaker energy costs and lackluster demand pulled down PE prices . Players attribute the persistent strength of the spot ethylene market to limited spot availability stemming from a number of planned and unplanned shutdowns. In production news, Shell declared a force majeure from its 960,000 tons/year cracker in Singapore earlier this month, with players commenting that this force majeure may remain in place for three to six months. In addition, Thailand’s PTT Global is planning to shut a 1 million tpa cracker for a 40 to 45 day maintenance in late January while Taiwan’s CPC shut a 380,000 tpa cracker in mid-December. CPC’s cracker is slated to restart in February. While spot ethylene prices have been buoyed by limited supply and regional production issues, weaker energy costs and lackluster demand have pulled down PE prices in the Chinese market. A source from a Middle Eastern producer reported that they announced their January prices to Asia with decreases, commenting, “Buyers are keeping to the sidelines as they believe that lower crude oil prices will continue to weigh down on PE sentiment.